Albert Einstein's Theory of General Relativity predicts that the gravitational pull of a massive body can act as a lens, bending and distorting the light of a distant object. A massive structure somewhere between a distant quasar and Earth can "lens" the light of a quasar, making the image substantially brighter and producing several images of one object. 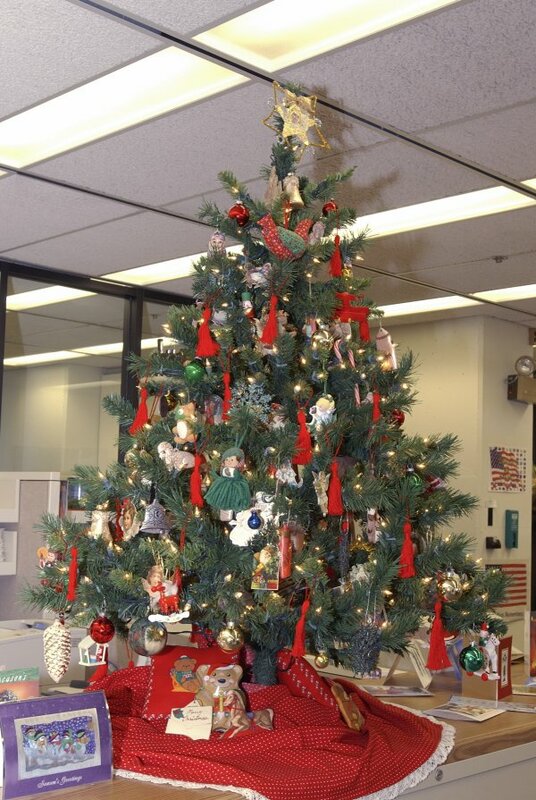 Procurement's Joyce Serritella goes all out when it comes to seasonal decorations. 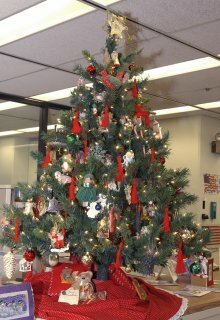 Visit the 4th floor on Wilson Hall to see the decorations for yourself. National civilian science labs and state research institutions across Illinois could be among the winners in a wide-ranging energy bill before Congress that could also help develop new coal technologies and hydrogen-powered cars. The authorized funding for the U.S. Department of Energy's Office of Science would increase 65 percent by 2008, reaching $5.38 billion, under a provision sought by Rep. Judy Biggert (R-Ill.). The fate of the new funding provision is uncertain. The energy bill has passed the House but is stalled in the Senate. Analyzing data taken in Run II of the Tevatron, the DZero experiment sees evidence for the new particle dubbed the "X(3872)". In the top curve in the figure, two peaks are present. 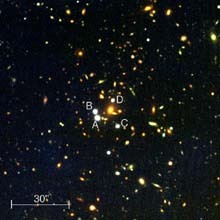 The large bump on the left corresponds to the well known psi(2s) particle, a bound state of c-cbar quarks, which was first observed in the 1970's. However, there appears to be a second peak at a higher mass. 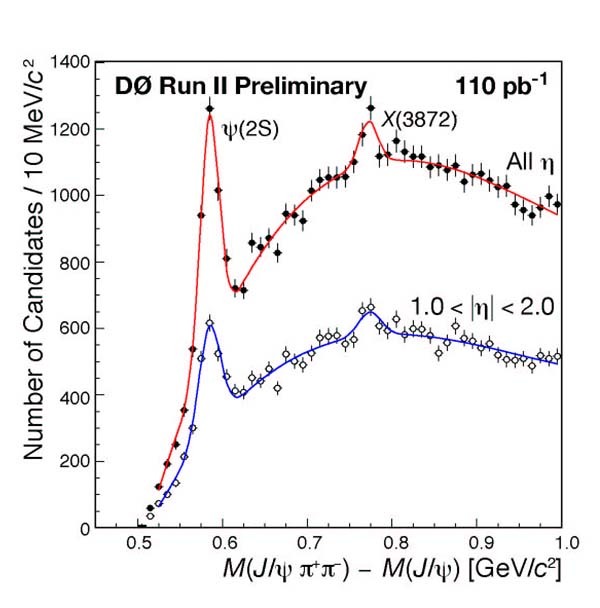 This peak corresponds to the particle originally reported by the Belle collaboration, and recently confirmed by CDF. At this point, we don't know whether this particle is simply another c-cbar bound state or something more exotic, e.g., a loosely bound "molecule" of charm mesons. The lower curve in the figure shows the data for a range of production angles closer to the proton beam line, a previously unexplored region unique in DZero's coverage that may prove important in unraveling the properties of the new particle. The DZero experiment is currently re-processing its data, and will soon have available twice as large a sample of these events to study. This larger sample and the acquisition of future data will help elucidate the true nature of this particle. 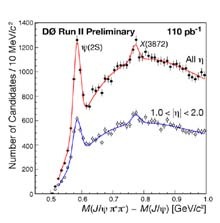 Sally Dawson, senior theorist at Brookhaven National Laboratory, points out, "X(3872) is an exciting discovery, since it doesn't quite fit into conventional models". Brad Abbott (left), University of Oklahoma, has worked on the analysis of the X state. Guennadi Borissov, Lancaster University, UK has made significant contributions to our track recognition and reconstruction algorithms as well as B analysis code. Fermilab will host the next Virtual Ask-a-Scientist on Thursday, December 18 from 7:00 p.m. to 9:00 p.m. The featured scientists will be Matt Malek of Fermilab's Particle Physics Division and DZero experimenter Vivek Jain, Brookhaven National Laboratory. Interested participants may join the online chat session on the evening of December 18 from Fermilab's homepage. The Fermilab Library manages the SPIRES HEPJobs database. This lists jobs in particle physics and astrophysics from all over the world, and allows people to search for jobs in a variety of ways (country, field, rank). The jobs are checked every two months to ensure the positions are still open. The HEPIC Employment Opportunities service has recently merged with the SPIRES HEPJobs database so that people on the HEPIC jobs mailing list will still receive regular emails concerning new jobs. If you have any questions please contact Celina Paul. Have you purchased, sold or refinanced your home, married, divorced, or had a new addition to the family? These are just some of the reasons why you may wish to provide payroll with a new W-4 exemptions form for 2004. These forms are available in the Payroll Department, or at the IRS web site; or go to the Business Services - Accounting web page and use the Federal Forms Link. You can buy Fermilab shirts, hats, sweatshirts, science toys and books as holiday gifts! Visit the Lederman Science Education Center between 9:00 am and 4:30pm, or its website. If you have questions, call Carol, x8258.